The demand of 4K-compatible broadcast equipment is spreading rapidly in Japan, Europe, North America, etc. for live broadcast of sporting events such as soccer and golf tournaments, as well as the production of dramas, documentaries and other genres of programs, produced both in studio and outdoors. Fujifilm released the world’s first 4K-compatible broadcast lens in 2015, and already offers four broadcast lens models worldwide in response to the expansion of the 4K broadcast market. The company’s lenses are used in a wide range of applications in recognition of their premium image quality and superior operability. The new FUJINON UA27x6.5BESM broadcast zoom lenses, being released now, deliver 4K quality across their zoom ranges by preventing resolution degradation around the edges and controlling all types of aberrations. 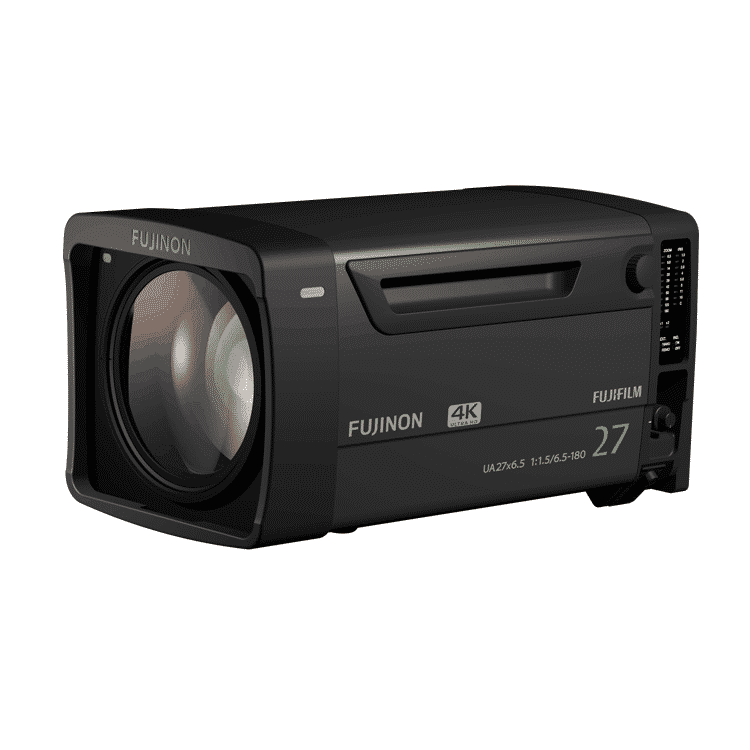 The FUJINON UA27x6.5BESM is a 4K-compatible 27x zoom lens, perfect for in-studio applications for news and variety shows. With the wide-angle focal length of 6.5mm, it can also be used to give a full view of a concert venue in live coverage. The “UA27x6.5” has a built-in extender*, which doubles its focal lengths, covering up to 360mm in focal length while maintaining image quality in advanced definition. FUJINON lenses by Fujifilm are known for high quality eloquent images, and have been used in the production of movies, TV programs and commercials around the world. Fujifilm will continue to tap into its optical, high precision forming and assembling technologies that have been nurtured over many years in the field of cutting-edge video expression, to further expand and enhance its product lineup, thereby addressing the diversifying needs of broadcast production. Fujifilm’s proprietary “HT-EBC (High Transmittance Electron Beam Coating)” multi-layer coating is applied for a high level of transmittance and color reproducibility. Latest optical simulation technology has been used in optical design to prevent resolution degradation around the edges and control all types of aberrations, so as to achieve 4K image quality across the zoom range. An aperture shape close to that of a circle is achieved by adopting nine aperture blades, allowing for footage expressions making use of a more natural bokeh. The FUJINON UA27x6.5BESM lens, covering 6.5mm at wide angle to 180mm at telephoto, is perfect for studio work including news, variety shows and music production. It delivers 4K definition in a multitude of situations, e.g. giving a full view of a concert venue in live coverage. This model uses a large-diameter lens with the maximum aperture ratio of f1.5 to draw out full optical performance with 4K compatibility. *** The sensor for converting position information into digital signals; Zoom and focus position data is divided in 16-bit resolution and output as electric signals.